Glenwood Caverns and Fairy Caves allow the visitor to view geologic wonders that have been in the making for millions of years, with a walking tour into these magnificent caves. Glenwood Springs Caverns, located in Glenwood Springs, Colorado, is a terrific place to bring the whole family when visiting the Rockies around Aspen. First discovered in the late 1800s, these caverns have been a popular attraction ever since, with their stunning crystalline formations. There are 127 steps, both up and down, and all with handrails. Explore the large underground rooms. You can get to Glenwood Springs Fairy Caves by taking I-70 exit 116 to Glenwood Springs. Turn left on 6th Street, then left on Devereux Road. Immediately turn right onto Two Rivers Plaza Road. If coming from Aspen, you get on Highway 82 headed north, crossing the bridge over I-70, to 6th Street and follow the remaining instructions above. Glenwood Caverns and Fairy Caves is open year-round but hours vary depending on the season. Park entrance admission with the Iron Mountain Tramway is $15 for adults and $10 for children 3 to 12. You can get park entrance and a cave tour for $27 for adults and $22 for children. Many more packages are available. The name of Glenwood Fairy Caves comes from the way light reflects off the water drops on the cave walls, creating the impression of twinkling fairies. When the cave was first discovered by the Darrow family, little was known about preservation of these natural wonders. Heat and air entered the cave and the living portion stopped living and growing. 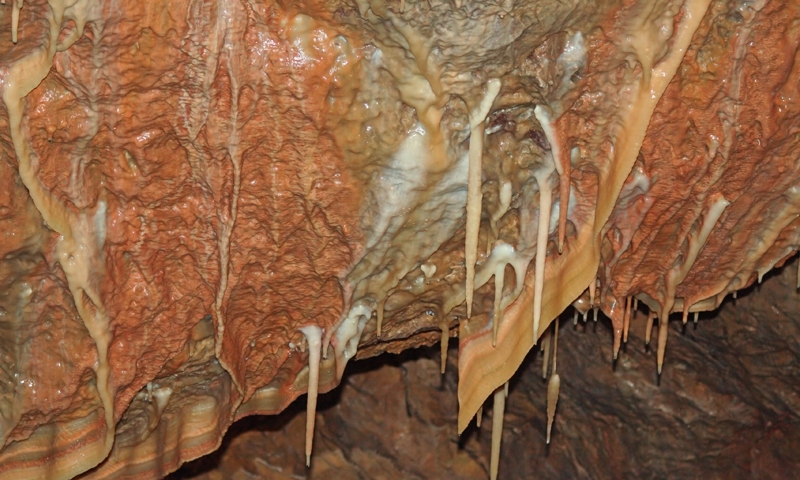 When the Beckleys took over, they worked to restore the correct conditions within the cave and now the formations continue to grow. Because Glenwood Caverns is at an elevation of 7,100 feet and there are many stairs to navigate on the tour, it is not recommended for those who have health problems or who are pregnant. You can still ride to the top on the Iron Mountain Tramway, however, and enjoy the views and get a bite to eat.